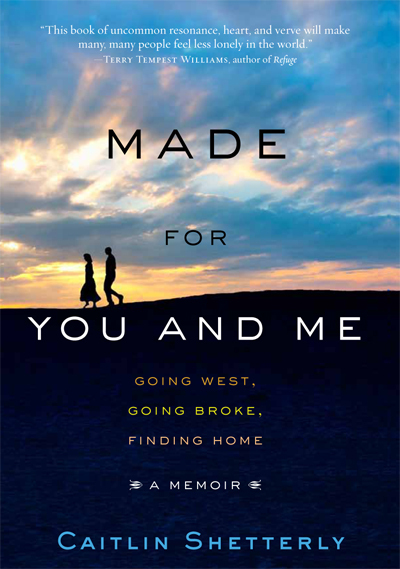 MP had the pleasure of reading Made for You and Me: Going West, Going Broke, Finding Home, a memoir by Portland-based author Caitlin Shetterly. The story unfolds as Caitlin and her husband, Dan, a photographer, leave Maine for new opportunities in Los Angeles. The move across country brings a series of unexpected challenges, including a difficult pregnancy for Caitlin, frequent travel for Dan, and an upstairs neighbor whose behavior is worrisome. After the birth of their son, Matthew, the recession hits full force. Dan’s freelance jobs slow to a halt. Their beloved family cat becomes ill. Dan and Caitlin do everything possible to find work. When they can no longer pay their bills, the family returns home in hopes of recovery. At its heart, Caitlin’s book is a love story, highlighting the bonds between husband and wife, as well as the kindnesses of family, friends and even strangers. Caitlin approaches the story with a raw, refreshing honesty which made MP laugh and shed tears of recognition. It’s a book parents can appreciate, as we strive to provide the best lives for our children, no matter the circumstances. To learn more about Caitlin Shetterly, visit: www.caitlinshetterly.com. One time when my son was still a baby only he and I were home and I really hurt my foot. Even though he couldn’t speak yet, he crawled over, sat beside me, and put his arm on my arm to comfort me. Thinking about that moment always makes me smile. Aren’t our children just the balm for our wounds? Motherhood literally saved me during a tough time! –Caitlin. Our daughter is 2 and a half, and it’s safe to say we’ve had plenty of ups and downs in those 2 and a half years. I’d say what sticks out in my mind is last Fall…shortly after her 2nd birthday, we just had one of “those” months. The furnace died, my husband was taken down by some kind of flu, our daughter had another ear infection (the one that finally led us to an ENT and a decision about surgery), and the final straw was discovering our little midget had LICE!! Ugh. Anyway, i remember saying to my husband that each thing that happened seemed so overwhelming, and that had it been 2 or 3 years before I would have chosen to put a blanket over my head and not get out of bed…but that funny little kid made every silly little bump seem minor. she takes everything in stride and keeps on going. what a great lesson! I love it! It’s so true. My son is the same for us. –Caitlin. I want to read this book so bad!! I laugh with my children every day but the past 16 months have been the toughest. We have been homeless since January 2010, my youngest was born in the middle of it all and then I almost died from a flesh eating bacteria 5 days after my baby was born. We are moving into our own place on the first (!!!!!!!!!!!!!) After many nights in the car, couch surfing and leaning on the kindness of strangers! We came put the other side laughing and as a strong family! So sorry to learn about your experiences over the past year, but I’m thrilled to hear you’ve found a place to call home. Amazing… what an incredible mom you must be. Lots of luck and happiness in your new home. So glad to hear you are on the other side and that you and your family made it through! I know my book will really speak to you, since we, too, went through tough times. You are not alone! Best, Caitlin. Every time that I slow down and watch my children eat is a blessing to me. To experience them nourishing themselves, not just with food, but with presence, is joyful. The presence of being only in the moment fully experiencing that bite of apple – the smell, texture, taste, temperature…………….I smile, hold onto that moment and then let it flow and be present with them. I love this. I, also, am so into my son eating nourishing food! There are so many recipes in my book, I hope if you read it, you get into that, too! Best, Caitlin. we had a very tough time for a while with my husband losing his job & us living with family… & the fact that at the WORST moments it seemed like everything was going only to get worse, & then our 2 yr old daughter would come up to us & say we were the best mommy & daddy ever..that made everything better. OH how sweet! Love, Caitlin. We had a *tough* first year-and-a-half with our daughter – she was 6 weeks early, and was a terrible sleeper for months. As I’d suspected, the infant months were REALLY tough for me. So I was really looking forward to the break we’d get by traveling to NJ to see my family at the holidays. My daughter had just recovered (or so we thought….) from a stomach bug, so we put her in the car and headed south. We stopped at Rein’s Deli in CT for lunch; the restaurant was full of people on their holiday travels. And not 10 minutes after we sat down, my daughter puked all over EVERYTHING. Our waitresses sprang into action, helping my husband clean up while I whisked our daughter into the bathroom to change her clothes. We were mortified… and yet everyone around us was SO kind and understanding. We tipped a ridiculous amount of money – what we now refer to as the “puke tax” – and continued on to NJ, come what may. So sorry to hear about your tough first year! Hope things are better now. In the mean time, great story. We also stop at Rein’s Deli on the way to visit my parents, and like you, we’ve had a few memorable visits (including CP#1 hiding underneath the table). Hope this episode didn’t spoil the restaurant for you… love their food. **Though, OK, I didn’t really need her to *hit* me. Toddlers. We’re working on it. I had a holistic healing experience over the weekend (I’m sick with a lingering cold) I thought it might help in broadening your services…First you take used Care Bears Live tickets and try to shove them in the client’s ears, then you take Chapstick and draw all over the client’s face, following that, you give several Pez dispenser injections…if none of that works, you sit on the patient and bounce up and down on their rib cage – at that point in time – if your patient isn’t laughing (and laughter is the best medicine) it may be something more serious.